Italian National Agency for New Technologies, Energy and Sustainable Economic Development (ENEA) has published a magazine “Energia ambiente e innovazione / Energy and environment innovation”. 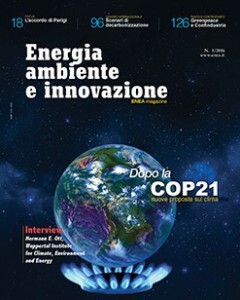 LCS-RNet Secretariat and Steering Committee with Dr. Christophe Cassen (CIRED) and Dr.Uwe Schneidewind (Wuppertal Insutite) wrote the article “Post Paris Agreement Progress Report of the International Research Network for Low Carbon Societies” in “Quadro Internazionale / International framework” part. In this article, they mentioned about the growing importance of knowledge/wisdom sharing and capacity building in worldwide and cross sectoral level after the Paris Agreement, which means the almost all nation in the world are going to, or have already been in the implementation stage to trigger action in the low carbon direction in order to achieve 2 degree (in the effort to limit temperature increase to 1.5 degree) target. Science sector will be required new mindset such as “shift” from their current style, and the role of research communities as transdisciplinary platform or “real world labs” will be increasingly important. In this context, they descrived the role of LCS-RNet, including what they have done and what they will do in the world after the COP21. Chapter of “Post Paris Agreement Progress Report of the International Research Network for Low Carbon Societies”.